According to Marvel, Avengers: Infinity War was the most ambitious crossover event in recent cinematic history, but video game and software development company Epic Games considers the upcoming collaboration between its red-hot co-op sandbox survival title Fortnite and Infinity War the biggest and best mash-up ever. 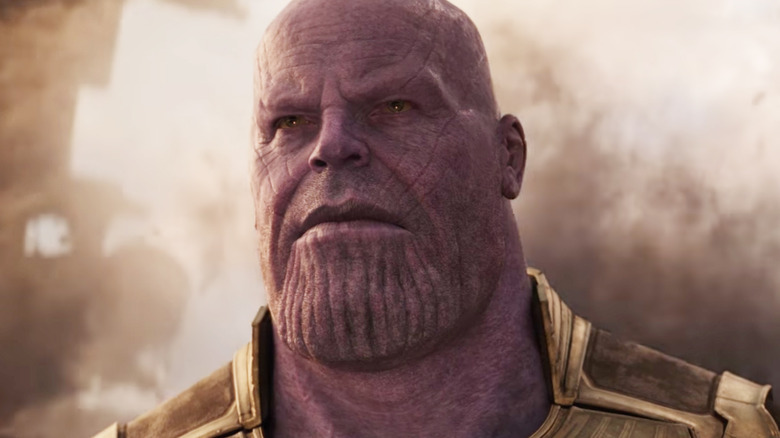 On Monday (May 7), Epic Games announced that it had been hard at work preparing a groundbreaking crossover with Marvel that will see Avengers: Infinity War villain Thanos, played by Josh Brolin, drop into Fortnite's insanely popular Battle Royale mode starting on Tuesday (May 8). Entertainment Weekly confirms that the crossover event, entitled "Infinity Gauntlet Limited Time Mashup," will play as a typical Battle Royale fight to the brutal finish — with the exception of one key difference. Rather than simply duking it out with 99 other players, Fortnite fans will descend onto the map and scour the nooks and crannies of its various locations to get their hands on the Infinity Gauntlet containing all six Infinity Stones. The lucky player who finds and equips themselves with the Mad Titan's signature hand accessory will actually turn into Thanos himself and get super-charged with a power boost. It's unknown whether the gauntlet will be placed in a random spot on the map or if it will be set somewhere in a distinct secret location. Additionally, it wasn't confirmed how long the limited-time-only event will last. A crossover between Avengers: Infinity War and Fortnite makes a ton of sense, as the former is the biggest movie of the minute and the latter is perhaps the most talked-about game of the year. More than that, the film's directors Joe and Anthony Russo are huge Fortnite fans themselves, and even played the game while editing Infinity War — an indulgent activity that led them to contact Epic Games' creative director Donald Mustard about working together on a mash-up. "Out of the blue, I get this call from Joe. And after a bit of geeking out over each other's work, we start brainstorming these crazy ideas," Mustard told the outlet. "It was really important that whatever we did, it had to be super authentic to both Fortnite and Avengers: Infinity War, and something that fans of both would be excited about." For as much as the Russos adore Fortnite, the creatives at Epic Games love Infinity War. Mustard added, "Infinity War blew us away, and the Russos, [Marvel Studios President] Kevin Feige, and the whole team at Marvel have been incredible to work with. This kind of opportunity, where you have this mutual respect for someone's work and you're on the same page about doing something cool for fans, is rare and really exciting. We hope players love it." Fortnite and Avengers: Infinity War will collide for the "Infinity Gauntlet Limited Time Mashup" event on Tuesday, May 8. The mode will be available for free across all platforms that run the game's Battle Royale mode: iOS devices, PlayStation 4, PC, Mac, and Xbox.